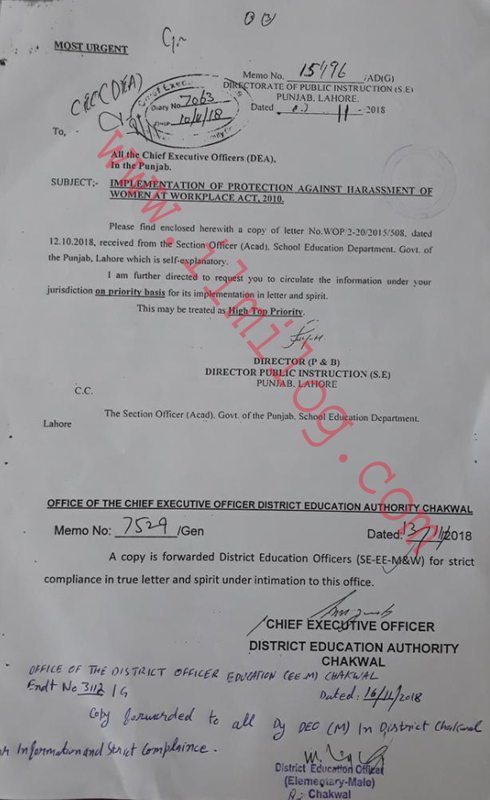 A notification by Office of the ombudsperson (Mohtasib) Punjab Dated Lahore the 17th October 2018 has issued regarding Women Harassment Data Protection Act 2010 in Ombudsman Punjab. I) All Administrative Secretaries. The government of Punjab. 2) All Commissioners & Deputy Commissioners. The government of Punjab All Medical Superintendents of Government Hospital Punjab. 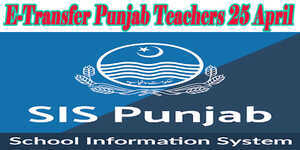 All Registrars of Universities in Punjab 5) All Regional Managers of Banks in Punjab. Subject Implementation of Protection against Harassment of Women at Workplace Act 2010. 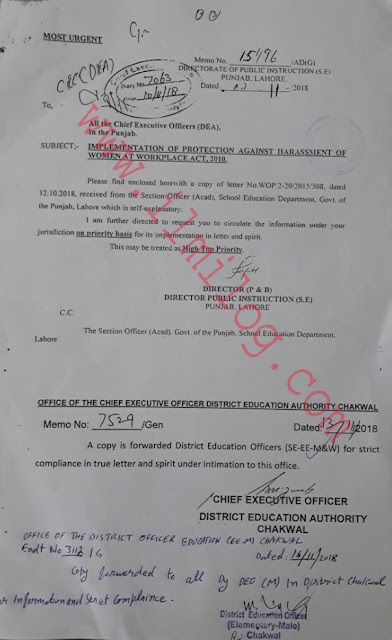 I ant directed to refer to the subject noted above and state that Office of Ombudsperson, Punjab was established under the Protection Against Harassment of women at the workplace Ad, 2010 (amended and adopted by the Punjab vide Act Ill of 2013) currently working under their Administrative Control of I&C Wing, S&GAD, Government of Punjab. 4. Your cooperation in this regard is solicited for the effective implementation of Act. 2010.